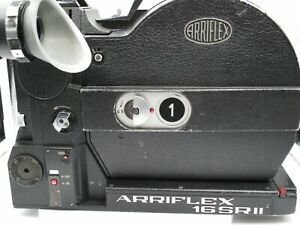 I am new to cinematography and have just acquired an Arriflex 16mm SR2 from Fullerton Camera in Fullerton, Calif. I believe the camera was owned by Loyola Marymount as it has their markings for the film school on it. One thing I noticed is there is no where to set the ASA/DIN so i cannot choose the film speed. I can see a U shaped cover over what looks like where the ASA control is supposed to be located. There are two screws in this cover. I removed the screws thinking I would find the ASA/DIN control there but could not seem to remove the cover. Another thing that is different is the mode selector which resembles a popsicle stick is missing. All I have is a slider switch that says Off and On with a red button. There is also a red test button above that one. The popsicle stick seems to have a slot for it but the stick is not there. My guess is either this camera has been modified or it is so basic, it does not have these settings. I also need to find out of the camera has Arri standard mount or bayonet mount. I dont have pictures of the mount but it is very smooth shiny chrome with two notches on either side. Mount is not as important as the two things that seem to be missing. I have attached a picture of the side of my camera. Please let me know what you think. I am a still large format (4x5) photographer moving over to cinema and need some assistance. Thanks you so kindly!! A film speed selector is only needed when the camera has an internal light meter - yours looks to have had that removed, which was common for SR2s. You'll need to use a light meter. Some SR2s also had the standby/run lever replaced with an on/off slider. The mount is Arri Bayonet, and the camera could be Standard 16 if it wasn't upgraded to S16. If you remove the mag and take a quick photo of the gate aperture we can tell you. Wonder why the light meter would have been removed. Personally, I dislike built in meters. I would rather use my Sekonic cine meter but it would seem better to have built in so I could adjust without removing my eye from eyepiece. I am pretty sure it is standard 16 but I will send pic of gate anyway. Thanks for your response. Internal light meters were more useful for news gathering or documentary work, but as video finally replaced film for news gathering during the early 80s and professional DPs preferred to meter themselves, the inbuilt SR2 meters were often removed, or the cameras were sold without them fitted.